The First A3 Roundtable Meeting on Chemical Probe Research Hub achieved a complete success in Fukuoka during September 22nd to September 24th in 2016. It was my great honor to take part in the Young Scientist Session. As a doctor course student to attend this meeting, I applied a poster presentation at first, however, the poster session was canceled. 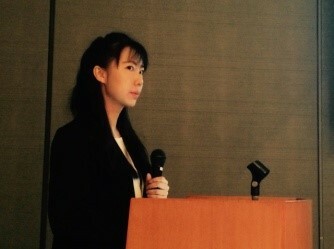 Therefore, I was given a chance to do an oral presentation. The topic of my presentation was “Tetradecyl 2,3-dihydroxybenzoate improves the symptoms of type-2 diabetic mice by modulation of adiponectin and IGF-1 signaling pathways”. During the presentation, I talked about ABG-001 (tetradecyl 2,3-dihydroxybenzoate) improving the clinical symptoms and energy metabolism disorder of STZ-induced T2D mice and db/db mice. Moreover, I also discussed the action mechanism of the anti-diabetic effects of ABG-001 on molecular and gene level. From this meeting, I came to understand the international leading scientists’ research work and the progress they have made in chemical biology. Firstly, I learned about a lot of novel research technology and experimental methods, I marveled at their achievement, at the same time, I also admired their persistence and perseverance. Each great scientific achievement needed a team to devote itself in a few years or even more than few decades, this persistent and insistance are worthy of learning. Finally, A3 program gives a wonderful opportunity for members to make friends and promote collaboration. A3 program also gives a communication platform for young students to present research results in front of the famous professors and their valuable advice and comments will result in better experimental design and achievements of better results, this will also give young students an opportunity for self-challenge and self-improvement. At last, I was grateful for A3 foresight program to support me to join in this meeting.